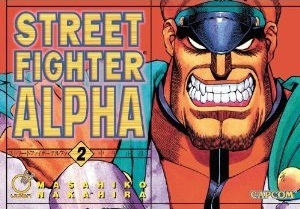 With the Street Fighter Alpha (SF Zero in Japan) series being very popular, it didn't take long for a manga adaption. 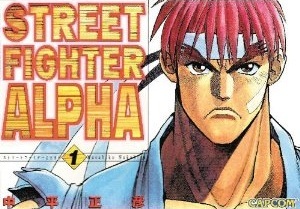 Written by Masahiko Nakahira (who would also work on Sakura Ganbaru and Ryu Final), the story focuses on Ryu, who struggles against the dark hadou. The main characters eventually find themselves entering a Shadowloo tournament, and Sodom happens to be one of the fighters participating there. Sodom defeats Cammy (known as Killer Bee in this manga) but before he can finish her off, Chun-Li challenges him. Sodom puts up a good fight, but is eventually knocked out of the ring. However, he uses his sais to climb back in, and realises that they are all in danger of being crushed (the ceiling starts to come down due to Vega and Adon plotting). Sodom saves the day by using his sais to stop the ceiling from crushing everyone. Eventually the ceiling goes back up, and Sodom is glad he can move, but Chun-Li and Killer Bee kick him in the face! 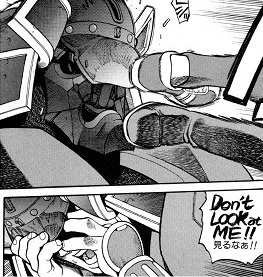 This breaks his mask, and he becomes so upset he says he cannot even fight any more without it. Chun-Li realises that Sodom is kind of a weak guy at heart! Guy also makes an appearance. He fights with Ryu, who has been consumed by the dark hadou. Guy easily defeats Ryu, even avoiding his shun goku satsu technique. Eventually Ryu snaps out of it. Guy is later seen saving Rose. This manga was translated into English by Udon Entertainment, in a two volume series. Like anything Street Fighter related Masahiko Nakahira has done, I would heavily recommend buying it if you are a fan of the series.